A merry Christmas to all the readers. Here’s hoping Santa was kind to you this year. This blog’s author, historically a Westie – though residing in Sydney’s Eastern suburbs these days, received a Western Sydney Wanderer’s jersey. Western Sydney also received some good news right before Christmas in the form of support for an airport at Badgery’s Creek from Liverpool Council, which includes the Badgery’s Creek area. It’s clear that the debate over an airport has moved on from whether one should be built, and is now over how best to build one so that Western Sydney receives the maximum benefit. Today’s post is about engineering solutions for efficient movement of people in the form of 2 videos. The first is in Spanish with English subtitles from Santiago, Chile (taken from the great transport blog Human Transit). It explains how a gate in the middle of a platform ensures that passengers enter the train carriage at the right spot, rather than trying to jockey for a good position when leaving the carriage onto the platform. While this gate appears irrational from the perspective of the individual, it makes the movement of people more efficient overall, even to the benefit of those who might appear to be worse off as a result. In Sydney, the marshal’s trialled at Town Hall appear to mimic this sort of idea. While the North West Rail Link could initially see overcrowding at Chatswood as large numbers of passengers transfer from one train to another until such a time as a second Harbour Crossing is completed. Both scenarios could learn something from this low-tech engineering solution. The second video looks at how intersections in the Netherlands are designed to allow bikes and cars to cross safely. The simplicity of the solution is breathtaking. Even more impressive is the way it allows right hand turns to be executed safely and easily (in the video they are left hand turns, due to the Dutch driving on the opposite side of the road to Australians). With the accelerated expansion of bike paths in Sydney, this is also somewhere that city planners in Sydney could learn a thing or two from overseas. Public transport in Sydney is going through a complete re-vamp, with “The Hop” becoming the universal brand for public transport. 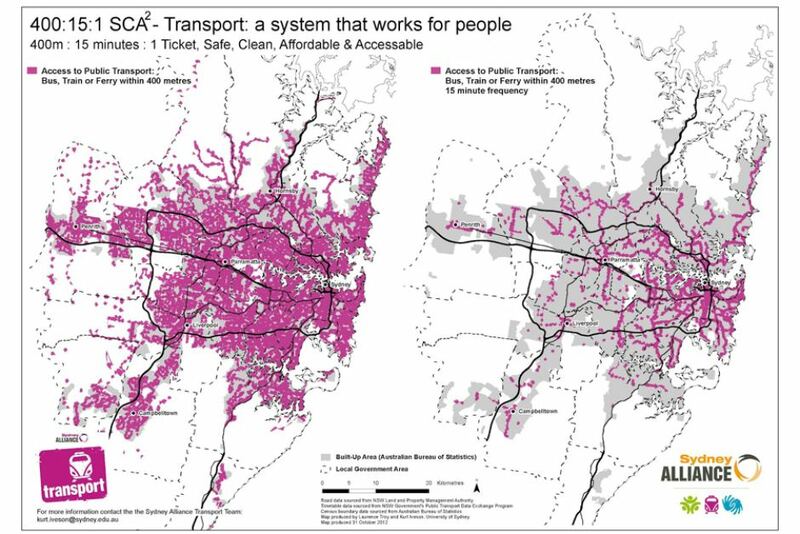 This is an essential part of creating a system that is seen as a complete and unified public transport network, rather than one which is just a collection of networks (rail, ferry, various bus operators, etc) cobbled together. It also presents an opportunity to create information for the passenger (or “customers” as the government now insists on calling them) that is prepared in a way that is most logical and useful from their perspective. The introduction of real time data for transport apps (first for buses, then later for trains) is a definite improvement. 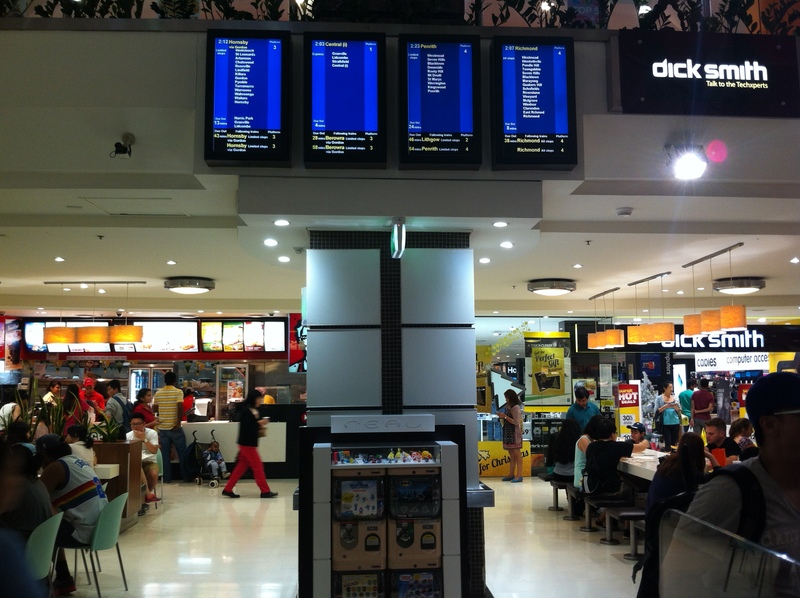 Providing passenger information displays (PIDs) on the Sydney Trains network in locations other than on the platforms or next to the ticket gates is another good move. 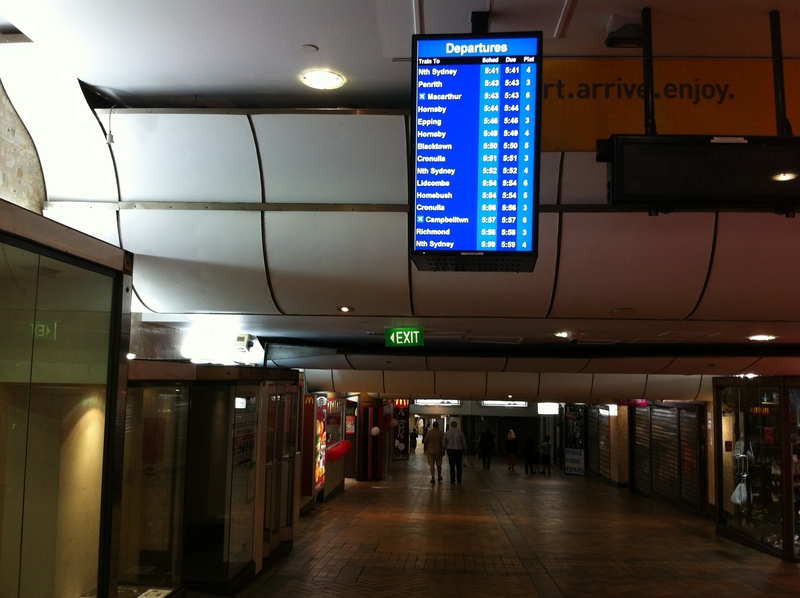 Two examples of the latter include the PIDs that were put into the Westfield food court adjoining Parramatta train station many years ago (see image above), allowing passengers to see when the next train arrives before beginning a walk to the platform which could take a number of minutes; while a more recent installation of PIDs near the street entrance of the shopping arcade that leads into Wynyard Station (see image below) tell passengers when the next train to a particular station arrives and to which platform, removing the need for them to check all upcoming trains to work out which one will get them to their destination first. This final example is actually a step back in time to the 1990s, when PIDs were often organised in this way. At major stations, passengers could look up their station from an alphabetically ordered list to see which train would get them to that destination fastest. This is important, as the quickest journey may not simply be the next train to arrive, such as if a subsequent train is an express that overtakes the earlier train. Today this system of communicating information is all but gone. Even the example above from Wynyard isn’t as straightforward and logical as first appears. Rather than ordering stations in an easy to look up manner, it orders them in chronological order of soon to arrive trains. It also only lists major stations. On top of this, the process of looking up train services by line has been complicated by the re-naming of lines to numbers (T1, T2, T3, etc). 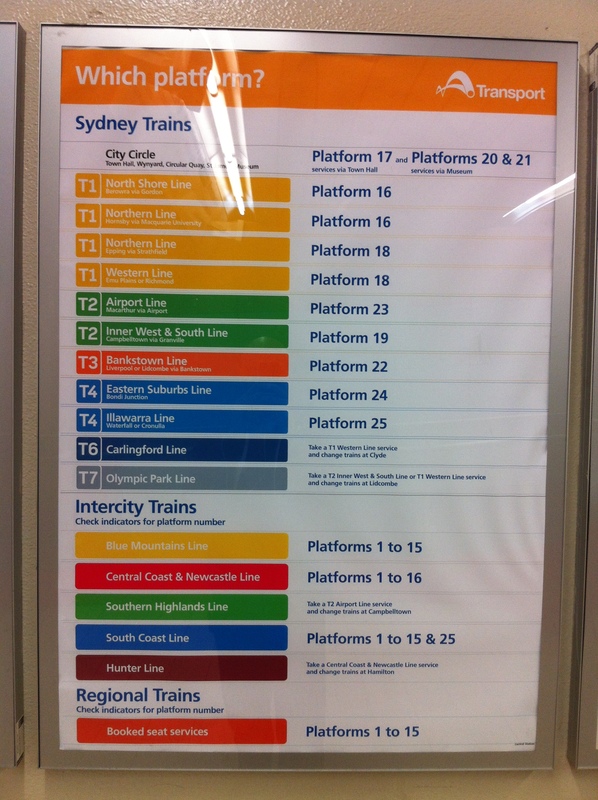 Someone who wants to reach Westmead from Central, for example, should take a train on the Western Line (T1). 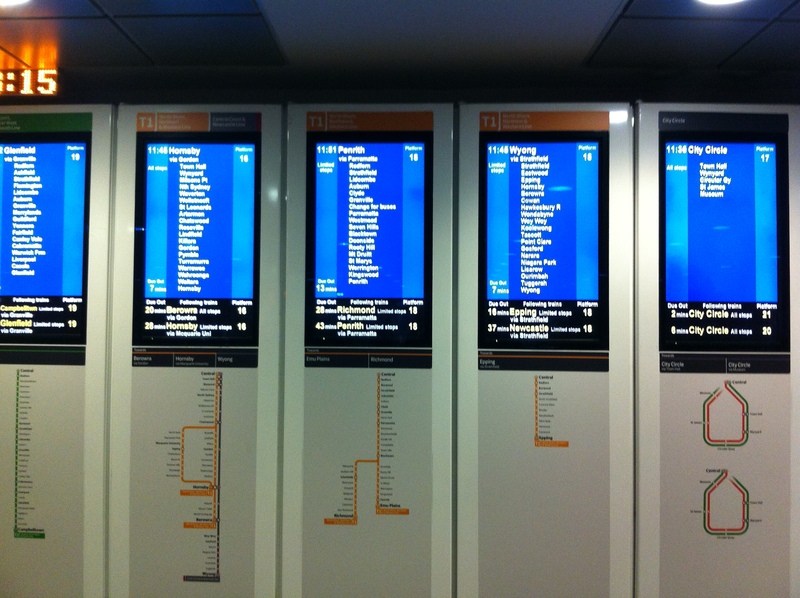 But there are 3 different PIDs for T1 (see image above), and each of them lists all the line names (Western/Northern/North Shore), rather than the more logical choice of labelling them T1 – North Shore/Northern (left), T1 – Western (middle), T1 – Northern (right). This would allow the passenger to focus on the middle PID to find when the next train to Westmead is and which station they need to go to. Given that this very information is available a short walk from where these PIDs are (see image below), giving this information in that format should not be a difficult thing to achieve. Even better, Transport for NSW could return to providing information to passengers by first asking them where they want to go, then telling them the best way of getting there. This would be a big improvement of the current system where the passenger must also work out how to reach their destination, then look at the relevant PID and wait for all the stations to scroll along before determining when and where to go for their next train. 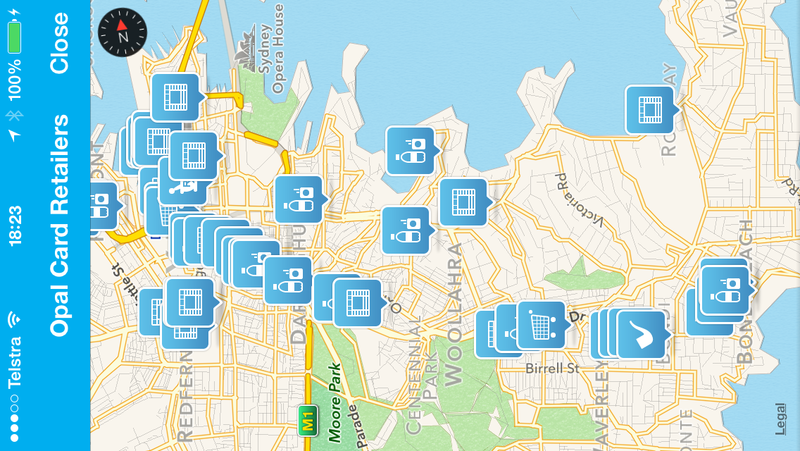 Opal rolls out to 333 bus, then Coogee and Randwick? Transport for NSW’s Opal smartcard begins operating on the 333 bus today. While the bus trial began earlier with the 594-594H bus, this represents the first major bus route to begin operating with Opal, and one that also feeds into the Eastern Suburbs Line on which Opal also currently operates. 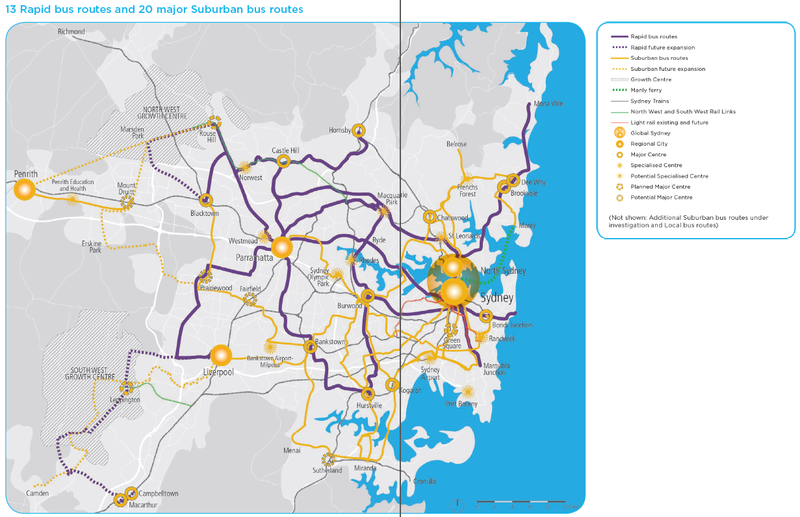 This rollout was previously hinted at by the inclusion of the 333 bus route in the Opal brochures (image above), and by the expansion of Opal top-up locations to places along the 333 route to Bondi Beach (image below). 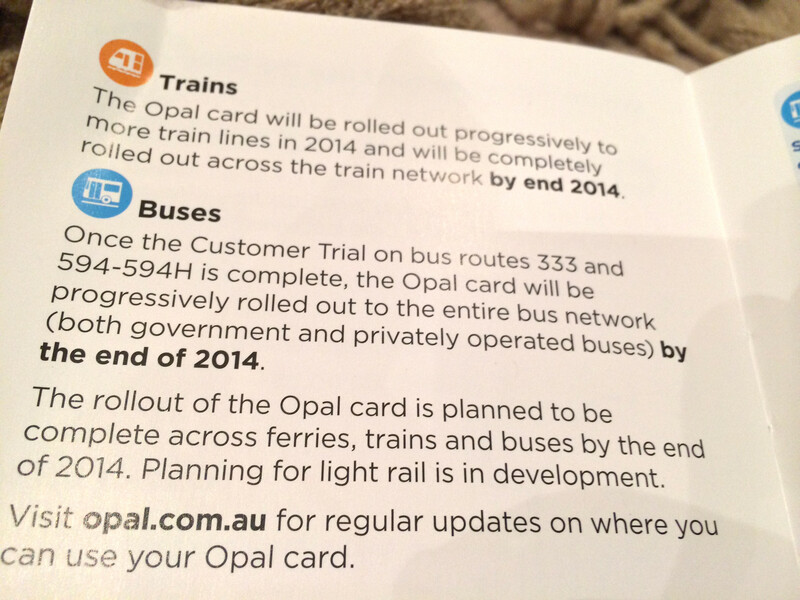 This suggests that Opal top up locations are a good predictor of which routes Opal is set to be rolled out to. Opal top ups at these locations would be consistent with the next Opal route passing through both Coogee and Randwick (such as the 373, 373, or 314). But the low number also suggests that this could be some time away. What has been confirmed is that the next expansion of Opal on the rail network will be on the Northern and North Shore Lines, out to the Central Coast, followed by the Western Line. Both of these are scheduled to occur in the first quarter of 2014. However, based on past experience, Opal’s rollout has generally happened 1-4 months ahead of the initial timetable, so this could occur as early as December (unless Transport for NSW decides to pause the rollout during the Christmas/New Year period). Opal was initially said to be completely rolled out “by 2015”, but more recent announcements have begun to mention “end of 2014” instead, a sign that the rollout is on or ahead of the initial schedule. Opal was rolled out to all ferries in August earlier this year, while there is still no word on when it will be rolled out to light rail, other than the “end of 2014”.